Anyone who has tried to grow orchids or keep a bonsai tree alive will tell you that cultivating plants is not always simple. My thesis research absolutely depended on cultivating certain types of “plants” and keeping them alive, so that I could investigate the factors that boost or thwart their ability to grow. My specimens were among the most ubiquitous organisms on Earth and critical to supporting life on our planet. Yet we know surprisingly little about them. That’s because it’s so difficult to observe them in their natural habitat—the ocean. 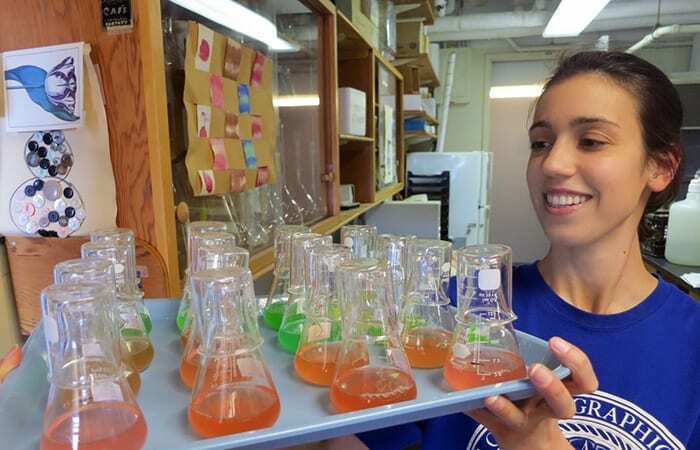 To make some headway into learning what allows them to grow, reproduce, and survive in the ocean, ironically we needed to be able to grow them in the laboratory. And that’s just a very different environment from what they encounter in nature. My specimens are remarkably abundant and are found across the world’s oceans. Yet no one even knew they existed until they were discovered in 1979 by scientists at Woods Hole Oceanographic Institution (WHOI), Stanley Watson, John Waterbury, and Freddy Valois. They are called Synechococcus, and they aren’t plants, but rather single-cell bacteria. Though they are leafless, rootless, and adrift in the sea, they use the same machinery as terrestrial plants—photosynthesis—for the same end: to convert carbon dioxide into organic building blocks. Collectively they move mammoth amounts of carbon around the planet. They take about 20 percent of the carbon dioxide drawn from the air into coastal waters and transform it into biomass—creating a critical source of food at the base of the marine food chain. In the process, they also release a significant portion of the oxygen we breathe. The ocean is filled with photosynthetic plankton more numerous and varied than any fields or forests of terrestrial plants. But these vital ecosystems remain largely unexplored because of limited access and observational tools. 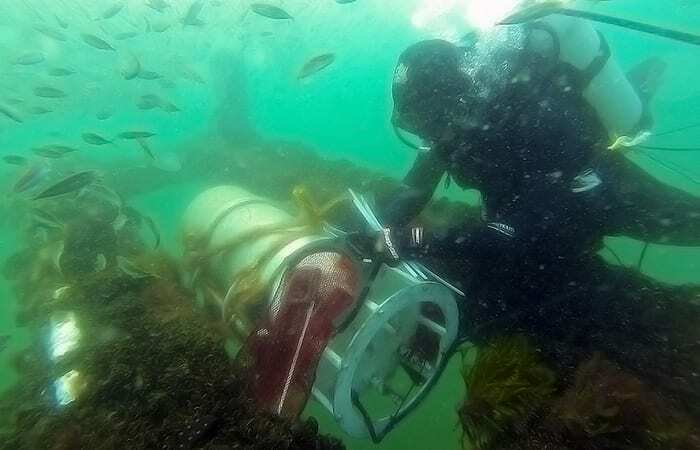 In 2003, my thesis co-advisor, biologist Heidi Sosik, began using a new automated underwater instrument that she co-invented with WHOI scientist Rob Olson. The instrument, called FlowCytobot, detects and records small phytoplankton. Plugged into a seafloor node, it receives power via an undersea cable from WHOI’s Martha’s Vineyard Coastal Observatory. It transmits hourly observations of microscopic plankton off the coast of Martha’s Vineyard back to shore. Over the last twelve years, FlowCytobot has revealed complex patterns of Synechococcus abundance. To understand some of these patterns, we needed information about the different types of Synechococcus that could make up the population. While FlowCytobot can detect Synechococcus, it cannot distinguish between different types. So we analyzed genetic material in seawater samples and identified five main types of Synechococcus off Martha’s Vineyard. Interestingly, these different types were more or less abundant at different times of year. Obvious questions arose: Why are certain Synechococcus more abundant during some seasons than at other times? Even though they are all in the same genus, do different types of Synechococcus have different responses to different water temperatures, light, nutrients, or other environmental factors? To answer these questions, we needed to conduct experiments on the different types of Synechococcus. To do that, we needed to maintain populations of them in the lab, which scientists refer to as “cultures.” My challenge was to find the right laboratory conditions that would enable the growth of the five main types of Synechococcus. As I found out, just as each type of plant has specific needs—for sun, soil, moisture, and fertilizer, for example—so do bacteria. Figuring out the exact requirements or conditions that allow bacteria to thrive in the lab can be a less-than-straightforward process. 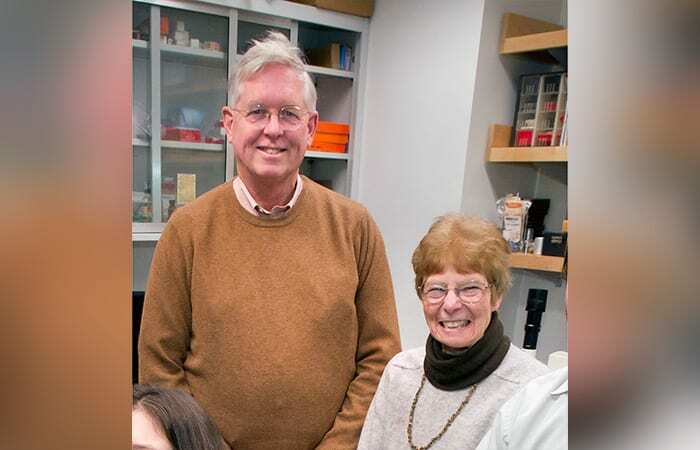 Being new to culturing Synechococcus, I was fortunate enough to be able to seek guidance on how to isolate different types of Synechococcus into culture from the pioneers, John Waterbury and Freddy Valois, still working here at WHOI. When they first placed natural samples of seawater containing Synechococcus into standard lab culture media in the late 1970s, the cells quickly died. “It took over a year to figure it out,” Waterbury said. At the time, media for bacteria contained a little bit of copper. It turned out that Synechocccus were quite sensitive to the metal. It wasn’t failing to add something that the bacteria needed, but adding something inadvertently that killed them. Smaller details matter when trying to coax an organism to grow in the lab—everything from sterilization procedures for equipment to the types of containers the cultures are kept in can affect growth. Many microbes that live in the open ocean are sensitive to glass, for example, whereas others, such coastal Synechococcus, seem to prefer it, even though it isn’t part of their natural environment. Most researchers have a few tales of cultures either growing happily or dying for no apparent reason. Another member of my Ph.D. thesis committee, MIT microbiologist Penny Chisholm, tells the story of a photosynthetic bacterium that she discovered called Prochlorococcus, which is a sister genus to Synechococcus. She had been culturing them in her lab, but when their building was being renovated and the lab had to move across the street for a year, Prochlorococcus was apparently not pleased with the location change. “We had these beautiful new incubators, that the cells simply would not grow well in,” Chisholm said. Everything else, from the containers to the media recipe, had remained the same. When the lab got to move back to the original building, the Prochlorococcus cultures resumed their previous strong growth. 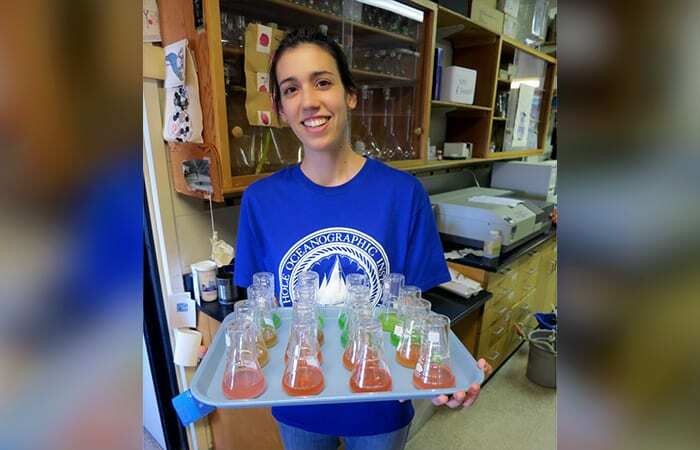 Armed with some well-tested methods of getting Synechococcus to grow in the lab, I set out to try to culture as many types as I could from seawater samples taken at the Martha’s Vineyard Coastal Observatory. The process starts with spiking the seawater with a small amount of media that supports Synechococcus growth. You hope that the extra nutrients in the media will encourage the cell growth you want. However, the sample probably contains other organisms that find the media tasty, and they may start to grow as well. This can be a problem: If these organisms grow faster than Synechococccus in culture, they will outcompete the bacteria. In addition, different types of Synechococcus may also be in competition with one another, with the result that one type may end up dominating the culture. This was a special concern for me because I was trying to isolate as many different types of Synechococccus as I could. To preclude competition, I used techniques to try to separate different types of Synechococcus. One technique is to spread out the seawater samples onto media made with agar, a gel-like substance. Oddly enough, Synechococccus is amenable to growing on a semi-solid surface, even though it ordinarily spends its entire life in seawater. Spread out on the agar surface, cells have an opportunity to grow away from other cells. Once the cells have divided enough to be seen with a microscope, I could pick cells off the surface—trying to get only Synechococcus—and put them back into liquid media. This process can be repeated multiple times to ensure that only Synechococcus remains in the cultures. Using the above methods, combined with a lot of patience, I cultured not five different types of Synechococcus from the Martha’s Vineyard seawater samples, but 13 different types. Many of these matched the main types of Synechococcus that I identified from the genetic analyses. These additional types of Synechococcus were in the seawater, but likely in much less abundant populations. With cultures of these different types of Synechococcus in hand, we are now poised to investigate some of the differences among them. We can further explore the various physiological factors and environmental conditions that control when and where each type grows, reproduces, and survives. We have indications that certain Synechococcus can’t use nitrate for growth, while others can use different sources of nitrogen, such as urea and amino acids, as nutrients. 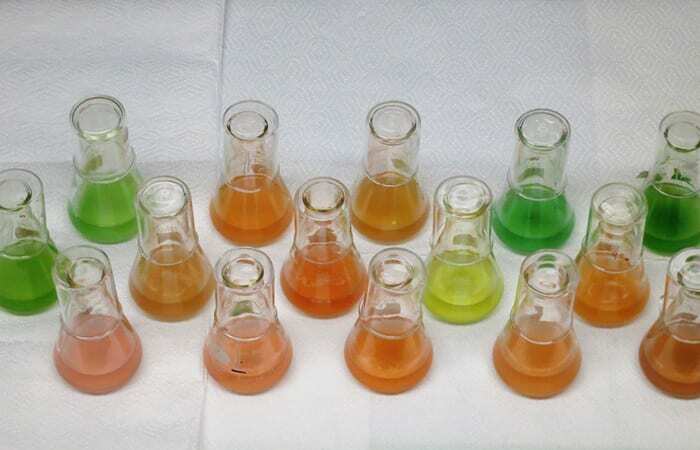 Some types have different photosynthetic pigments, indicating that they can harvest different wavelengths of light and thus have advantages in clear or turbid waters. Different types exhibit different tolerances for water temperatures or salt content. Others may be more or less palatable to various animals that graze on them, or more or less vulnerable to viruses that can kill them. All these differences favor different types of Synechococcus at different times and in different locations, allowing them to occupy distinct ecological niches as environmental conditions shift. Ultimately, the more we learn about how individual Synechococcus types behave, the more we can understand the complex population dynamics of this essential marine organism. Synechococcus cultivation has been a rewarding part of my Ph.D. thesis and has suggested new research ideas for the future. As a caretaker of Synechococcus, I gained perspective on the organism that I know I would not have had if I had not spent time growing them. I came to appreciate that, just as humans have different likes and dislikes, so do these amazing and highly productive marine bacteria. I also developed a deep appreciation for the value of culture collections and the hard work of their curators. Culturing microoganisms involves tenacity, ingenuity, and patience, but even with these attributes, luck and serendipity can also be an important part of the recipe for success. 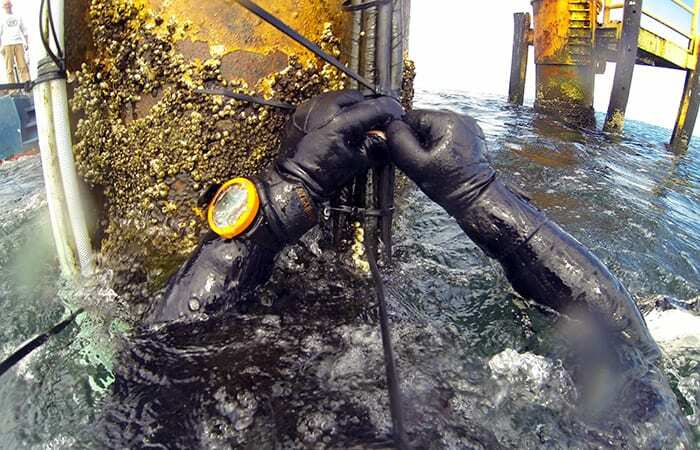 This research work was supported by a Department of Defense National Defense Science and Engineering Graduate Fellowship; grants from the National Science Foundation, the National Atmospheric and Space Administration, and the Gordon and Betty Moore Foundation; the WHOI Ocean Ventures Fund; the WHOI Coastal Ocean Institute; and a private donation. 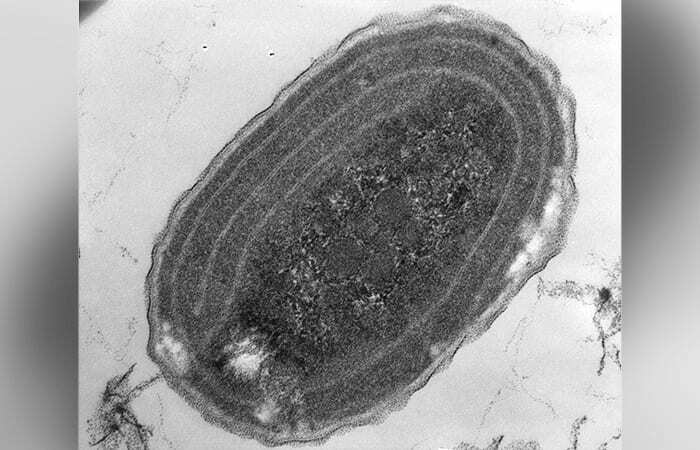 An electron micrograph image of Synechococcus, single-cell marine bacteria that, like plants, use photosynthesis to convert carbon dioxide into organic building blocks. They play an important role in cycling huge amounts of carbon from air to ocean and are a big source of food at the base of the marine food chain. With cultures of different types of Synechococcus in hand, Hunter-Cevera began to investigate some of the differences among them, exploring various physiological factors and environmental conditions that control when and where each type grows, reproduces, and survives in a complex marine ecosystem.